The devotion to the Sacred Heart of Jesus has had in the Church, like the coming of the Messiah in the Old Law, its prophets and precursors. In the Middle Ages, St. Mechtilde, St. Gertrude, later on St. Canisius and others, among whom the great missionary of Normandy, St. John Eudes, must not be forgotten. This latter devout client of Our Blessed Lady recognized but one Heart in the Hearts of Jesus and Mary. Although in the strictest sense of the word, he cannot be called a precursor of St. Margaret Mary, who, in an account of her life, written by herself in obedience to the orders of her superiors, declared it was Our Lord himself who deigned to prepare her from her very childhood for her great mission. Yet, as will be seen from what follows, we are as fully justified in calling St. John Eudes a precursor of this devotion as we are in calling St. Claude de la Colombière its first apostle. It was St. John Eudes who first introduced the devotion to the Heart of Our Lady, which he called the dawn from which the devotion to the Sacred Heart emanates. The Heart of the Son is, according to him, contained in the Heart of the Mother, and while the Heart of Jesus is placed prominently before the eyes of the world, he tells us to turn to the Heart of Mary and beg of it to open itself in order to give us the Heart of her Son. Whenever this great devotee of Our Lady spoke in his writings of the devotion to her Sacred Heart, he never failed to point out how, in honoring the Heart of the Mother, we are compelled to honor the Heart of her Divine Son. For, although on the one hand, these Hearts are materially separated from one another, on the other hand they are spiritually so closely united to each other that this separation must be considered as only exterior and accidental. For this reason, whatever Fr. 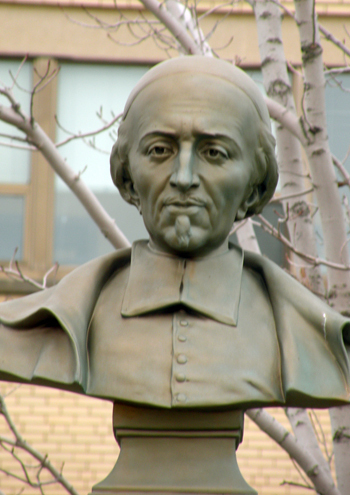 Eudes and his sons have done to spread and encourage the devotion to the Heart of Mary must be considered as having also been done to promote the devotion to the Sacred Heart of her Divine Son. As far back as 1659 he composed a Mass and Hours in honor of the Sacred Heart, for which he obtained the required approbation and permission to publish. 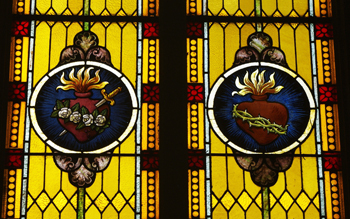 On October 20, 1672, the Feast of the Sacred Heart was for the first time publicly observed in all the chapels, seminaries and churches of the Eudistes, with the consent of the Bishops, and from that time it was consider one of the chief feasts of that Congregation. Until then no such public celebration had ever been held, even by those greatly professing this devotion. Thus we give to St. John Eudes the honor of beginning the public devotion to the Sacred Heart of Jesus. "Part One: Origin of the Public Cult to the Sacred Heart."